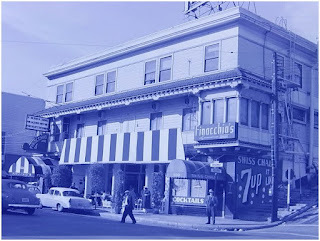 The Garden of Allah, a gay-owned cabaret was open in Seattle 1946-56. It featured mainly female impersonation, though some male impersonators also performed. Bill Plant took the name Peewee Nattajon in homage to an older performer called Nattajon (born 1895, died late 1960s). The elder Nattajon had been a character actor. Bill Plant says that he was in 13 Hollywood movies, including Beauty and the Beast and The Picture of Dorian Gray. However there is no Nattajon listed in IMDB. He is probably listed under another name – but which? 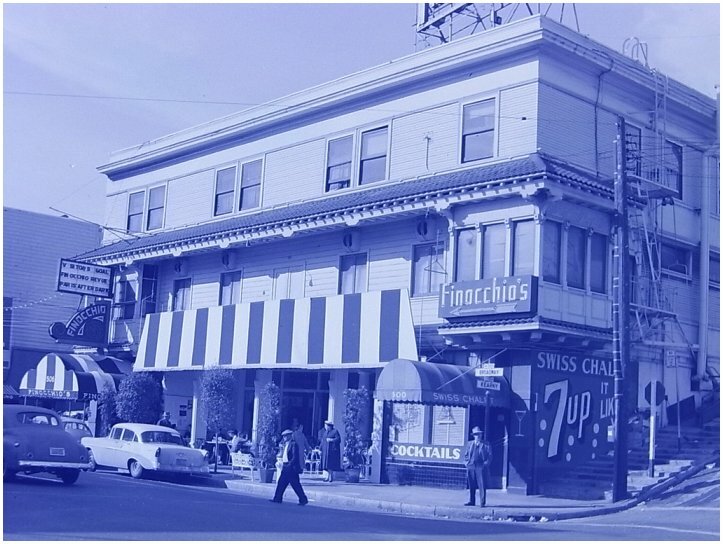 Finocchio’s, the famous San Francisco nightclub that featured female impersonators, was owned by Joe and Marjorie Finocchio. 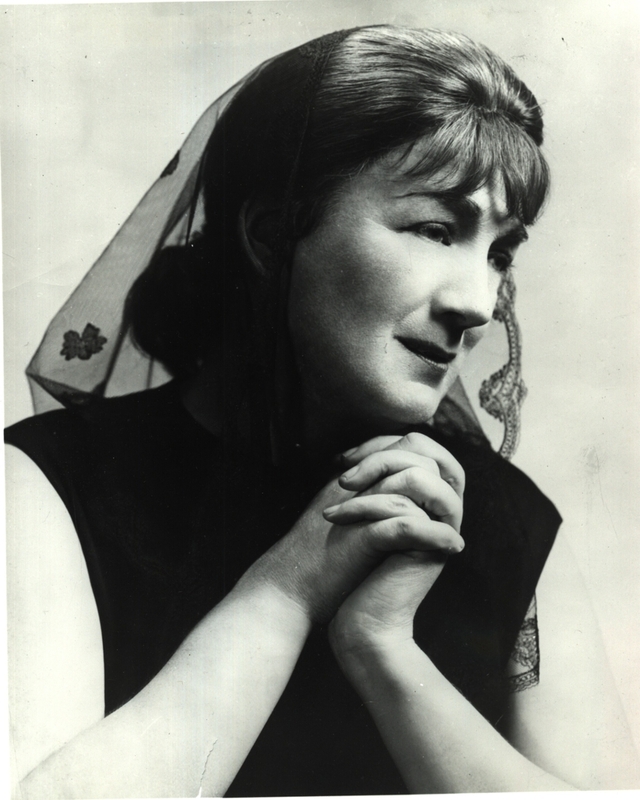 Marjorie died in 1956, and Joe remarried to Eve. 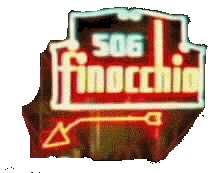 Rachel Harlow in Philadelphia was also born with the Finocchio name. No relationship has been established between them. Concetta Finocchio Jorgensen (1941 – 2012) daughter of Joe and Eve Finocchio had a short failed marriage that left her to raise four children alone. She worked doing publicity for her parents’ nightclub, but later was afflicted by MS, and became a disability activist. The husband who left was called Jorgensen. Surely not a relative of Christine? Probably not, but it is intriguing to find two of the most famous names in TG history born by the same person. Who is Gregory G Bolich? WorldCat tells us that Bolich did a Ed.D, at Gonzaga University in Spokane in 1983: On dating James : new perspectives on an ancient problem, and a PhD at the Union Institute in Cincinnati in 1993: Serving human experience : the boundary metaphor. He also has several book published through Lulu, but not listed in Amazon. There is no web site for GG Bolich, and no reviews of his books. 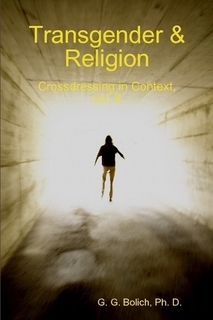 The transgender books are much more expensive than the theological ones. His books are not in the library. If I were to purchase his transgender works it would cost me hundreds of dollars. I cannot find any reason why I should do so. Does he have anything original to say, or are his books a regurgitation of the usual stuff? I do not know. How would I find out? Toni Ebel, post-op Hirschfeld patient in Berlin, fled Germany in 1934 after the Nazi takeover. She arrived in Czechoslovakia, claiming to be a Jewess. She settled in Prague using the name Antonia Ebelová. In 1937 she moved to Brno. Karl Giese, Hirschfeld’s lover, had also fled to Brno. In October 1938, Nazi Germany occupied the Sudetenland; in March 1939 Germany occupied the rest of Czechoslovakia. Giese killed himself before the Germans got him. Somehow Toni Ebel survived the war, and in 1949 became a citizen of the newly created German Democratic Republic (DDR). She was able to claim compensation from the DDR as a victim of Nazism. 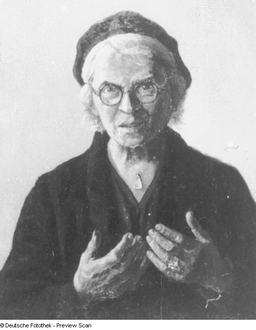 She was a minor painter and was recognized at the Akademie der Künste in East Berlin. She died in 1961 at the age of 80. We do not know how she survived the Nazi occupation. In the photographs included in Harry Benjamin’s The Transsexual Phenomenon, 1966, the 6th and 7th pages (not in the PDF version) are the before and after of an actor, both in a stereotyped pose more typical of silent films than of the 1960s. This actor has never been named. How an actor can transition in stealth and keep working is intriguing. The US trans actors of the 1960s such as Candy Darling were non-op (however, of course, several of the stars of Le Carrousel in Paris were in films in at that time). The first US trans actor known to have surgically transitioned was Ajita Wilson who did so in the mid-1970s. The unnamed actor in the photograph is the true pioneer in her field, and we know nothing of her.